The aim of this volume can be considered to be twofold. On the one hand, it makes accessible a number of hitherto unpublished texts by Muhamadi Kijuma (1855–1945), a multitalented artist, musician and poet from Lamu, Kenya, which are part of Swahili literature and history. The comments by Ernst Dammann (6th May 1904 – 12th July 2003) and by Muhamadi Kijuma (in the notes and letters), as well as by the editors, provide information on linguistic, cultural and historical issues. On the other hand, this volume documents and discusses research history: firstly, it provides information on the editorial history of Swahili classical poetry, tracing its lines of tradition. Secondly, the account of relations between Kijuma and various European scholars of Swahili language and literature is an important topic in this volume. The introductory part – besides general remarks – presents the papers read by the editors during the Kijuma Workshop on Lamu in November 2006. While Part I contains the collection as it was planned by Dammann, Part II presents additional findings. 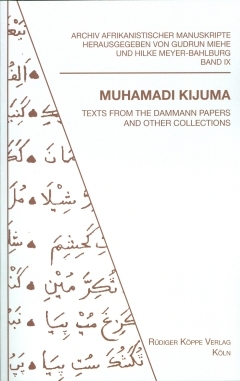 If available, Kijuma’s manuscripts in Arabic script are given directly after each text. Concerning the contents, Part I and II are structured along the same lines: they start with the letters, followed firstly by prose texts and secondly by poems, and end with the word lists. An appendix also presents three drawings by Kijuma that he gave to Dammann, as well as an index of the word lists found in Part I and II.